Krish Srikkanth has supported Rahul again.He said that the player like Rahul must be given chances, because the players like him are very crucial for team. Srikkanth said he also expected Rahul Dravid, who struggled for form last year, to play a crucial role at the No.3 slot in the Test team, especially during the away series in New Zealand. "He's a batsman with over 10,000 runs in Test cricket," Srikkanth said. "Dravid is also among the greatest batsmen the world has produced. If you don't give Dravid the extra leeway, whom are you going to give it to? "We have specific plans. 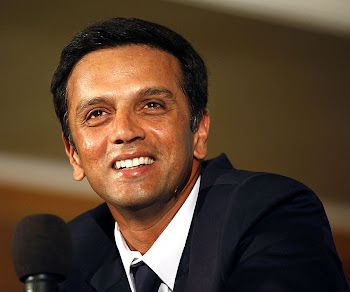 During the forthcoming series in New Zealand, a player like Dravid will be very crucial for us. There will be bounce and movement for the pacemen there. If India are to progress to the No. 1 ranking, it has to beat New Zealand in New Zealand. Dravid will be a key member of the line-up at the No. 3 slot." Srikkanth is doing perfectly right by providing support to the player who is struggling to get his form back.Rahul has proved him right by hitting a century at Mohali. "If India are to progress to the No. 1 ranking, it has to beat New Zealand in New Zealand." - agreed with this part. "Dravid will be a key member of the line-up at the No. 3 slot." - the problem - is it our goal simply to touch the number 1 spot and then start our descent? or is the idea to get to number 1 and stay there for a while? If the latter, then we should develop a number 3 who will stay with the team for the next 5 years and provide solidity to the top order. Dravid is not that Number 3, so even if we beat NZ in NZ with him @ 3, he will likely be gone soon after and we will have a problem at the most crucial batting position. It is absolutely valid to ask how do you fill a Dravid sized hole? However, the problem is not going away. Dravid is not getting younger. Better to drop him lower down in the order with an exit strategy of retirement by 37 at the latest or when his average drops below 40, whichever happens first. Meanwhile, develop a number 3 from the NZ series itself - maybe throw in Pujara, or Vijay? I completely agree with you.If Srikkanth is looking to develop a No.1 team, he must start bringing in the youngsters. But one thing which must be kept in mind is that the pitcehs in New Zealand are "hell" for a batsman. Won't it be a better idea to start using a youngster at No.3 in India? I mean will Pujara/Vijay be able to handle the bowlers as easily as they are doing in India? dera friends please go through this website and see the quality of rahul dravid.. dont cry for youngsters..